Who is Webb, you ask? Country Music legend Webb Pierce? U.S. Senator Jim Webb from Virginia? Well, although Senator Jim seems like a nice guy, and Mr. Pierce holds a remarkable place in our Country Music history, the Webb we refer to is our loyal Country Music mascot. 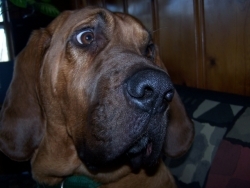 Webb, our Country Hound, is an affectionate and fun Tennessee-bred bloodhound. Read Webb's bio and learn about how he became part of our family and a lover of Country Music. Check out Webb's adorable mug by taking a gander at his Webb Pics gallery. Don't forget about the can't-miss video of Webb as a puppy! Also see how Webb cares about his canine pals by checking out Webb's Paw of Fame and his charity work with the Nashville Humane Association.